It has been a real foodie week here in the Big Apple with super fancy grilled cheese, bee hive cakes and freshly baked olive and feta pretzels. But the creme de la creme, all time superior, work-of-art, in a league of their own taste sensations, were the desserts we had on my birthday. Chikalicious launched about the same time Sean & I came to New York. A Japanese woman of immeasurable patience and skill opened her small and stylish desserts-only restaurant in 2003, and I was struck how very ‘New York’ the concept was. Where else could a 4 night a week, 20 seater, specialty restaurant survive? ( ….in Tokyo it seems – a sister restaurant just opened there last year… ) In any case, Chikalicious is a very special place to go, one that requires a zen approach and much respect. The ‘cheesecake’, a fromage blanc island served on a bed of crushed ice, and the warm chocolate tart are staples on the menu. So, knowing we could come back, we opted for two seasonal specialties, the Eclair of earl grey tea and vanilla sorbet with kumquat confit, and the Yogurt panna cotta with fresh pomegranate sorbet and crispy kataifi. The first was served with an orange muscat and the second with a glass of Brachetto d’Acqui Banfi. Even as I write this I think how austere it all sounds. This is something you consume, voluntarily…? I go back to zen. As we waited, with Louis Armstrong playing joyfully in the background and the full room buzzing quietly, our smiling Japanese host brought two small dishes to the table. 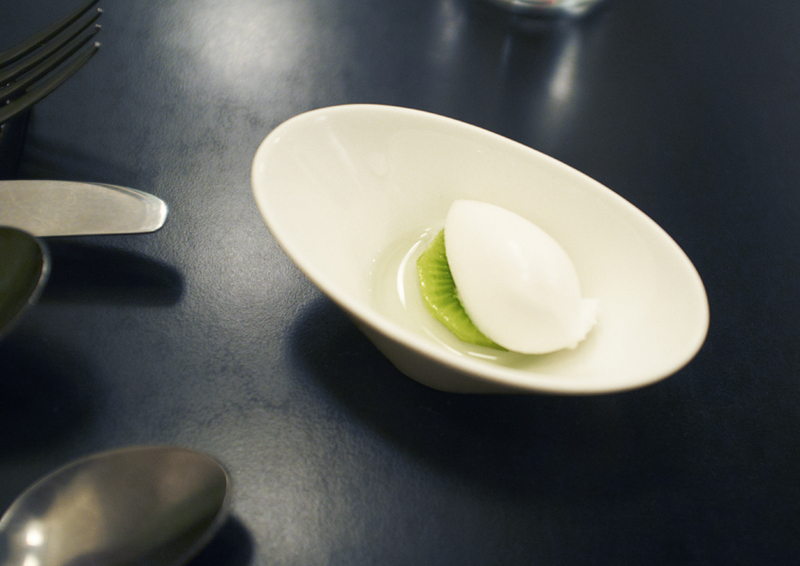 Both contained a perfect small quenelle of coconut sorbet sitting on top of a miniature slice of kiwifruit. A perfect white egg on a perfect slice of green. I felt like I had been served a dish of wisdom by a culinary Buddhist. The taste was exquisite. The desserts that followed were magnificent, and even though I would never normally consider any food that wobbles, the panna cotta ( with the pomegranate sorbet ) was extraordinary. Unfortunately, it was so cold that night that the battery on my camera drained quickly and I was only able to capture a shot of our aperitif. So I will have to go back and get proof of the Matisse, validation of the Van Gogh. Fortunately this will be soon. Until then, remember to mediate on your desserts….. This entry was posted in Food and tagged Chikalicious. Bookmark the permalink.